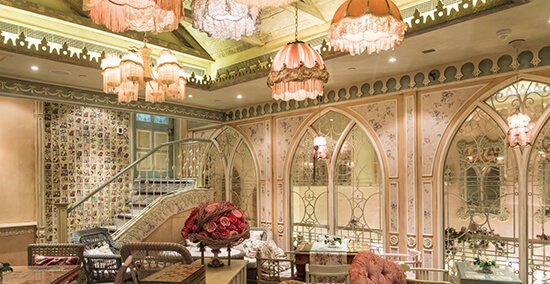 With its chintzy Victorian furniture, curtained-off corner booths and serious addiction to floral patterns, Shakespeare & Co might seem an odd spot for breakfast. It’s the kind of décor you might find in an eccentric stately home, but its morning menu is by far the best in the city. Take your pick from fresh juices, piles of pastries, and cooked options galore. Be warned: as the UAE is a Muslim country, you won’t find any pork products – so bacon is off the menu. Chicken sausages and turkey bacon (in my opinion) do not measure up. There are lots of Shakespeare & Co locations to choose from, but my favourite is Central Market, in the ground floor ‘Souk’. Nestled amongst the exotic incense burners, Turkish ottomans and Indian wardrobes, the restaurant’s décor feels even weirder – but there’s no better place to eat around here. Fill up, and then try out your haggling skills. The sunset views from Sonataya are fabulous too and it’s easily the kind of place where leisurely lunches turn into dinner and drinks. Before you know it the stars have come out, and the scent of shisha dances on the breeze. Emirates Palace isn't actually a royal residence, but it certainly feels like it. All soaring archways, glittering infinity pools and gilded décor, it's the ultimate in Arabian opulence – and a room here comes with a mighty price tag. But you don't have to stay at the Palace to enjoy its treasures: book a table at Hakkasan – arguably its finest on-site restaurant – to wine and dine in luxury. 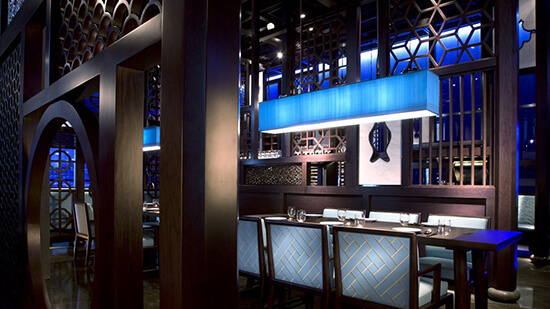 Hakkasan's reputation for superlative Chinese cuisine holds strong in its Abu Dhabi outpost. You'll feast on platters of fresh seafood, dim sum and incredible curries – all served up in sleek, contemporary surroundings. 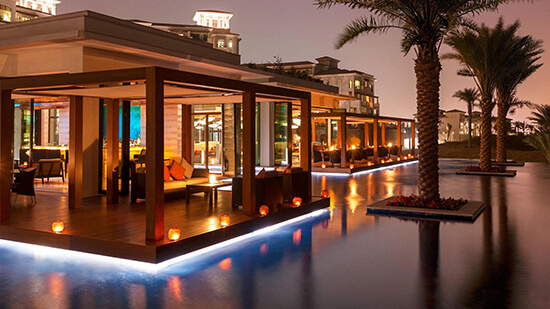 Most of Abu Dhabi's swankier eateries lack ambiance, but Hakkasan has charm in spades – and plenty of tucked-away corners for dining a deux. 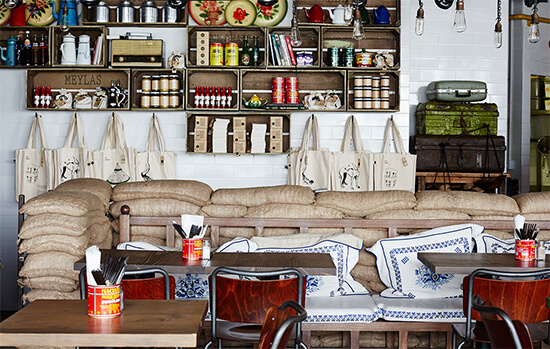 You might have heard of Jones the Grocer, an Aussie food chain that champions 'slow food' and affordable prices. 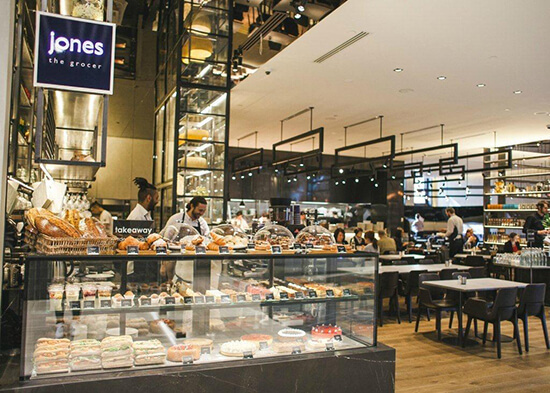 Among Abu Dhabi's pricey restaurants, it's a revelation – and Jones the Grocer is loved by locals and expats alike. There are lots of branches to choose from, but my favourite is in Pearl Plaza Tower in Khalidiyah – just off the beachfront Corniche. Think heaps of fresh salads, tasty grilled meats, and hearty risottos and pasta dishes. If you're feeling brunchy, you've come to the right spot: the coffee menu is extensive and imaginative, and there are cooked breakfast options galore. Note that Jones the Grocer restaurants aren't licensed (to obtain alcohol licences, restaurants must be in hotels) – so if you fancy a tipple, you'll have to go elsewhere. High tea doesn't get much higher than the Observation Deck at 300, a swish café on the 74th floor of Jumeirah at Etihad Towers. In this lofty spot you'll nibble on sandwiches, salads and quiches, and sip luxury teas and coffees. It's all very refined – although you'll be hard-pressed to stop gawping at the view. When you're perched 300 metres above sea level, Abu Dhabi's unique landscapes are laid out at your feet. The tiny white sand islands that fringe the coast, the domes of Emirates Palace, the busy Corniche beach, the high-rise hotels of Khalidiyah... There's no better place to soak up the sights over a cuppa. For a city that's so renowned for its luxury dining, it's ironic that one of the best places to find traditional food is completely no-frills. But until 50 years ago, the UAE relied on fishing, trading and pearl diving industries – so it's little wonder that real Emirati fare isn't adorned with gold leaf and truffle oil. Meylas was founded by Shaikha Al Kaabi, a young Emirati woman whose passion for her culinary heritage knows no bounds. She recreates the recipes of her childhood in this modest beach-side restaurant, using only locally-grown ingredients. Chbaab (traditional pancakes with date syrup) and balaleet (saffron noodles with egg) are particular highlights. Come hungry: you'll want to scoff as much as you can. The novelty of dining in a restaurant co-owned by Michelin-starred chef Marco Pierre White and world-famous jockey Frankie Dettori is tempting enough – and the food at Frankie's certainly lives up to expectations. 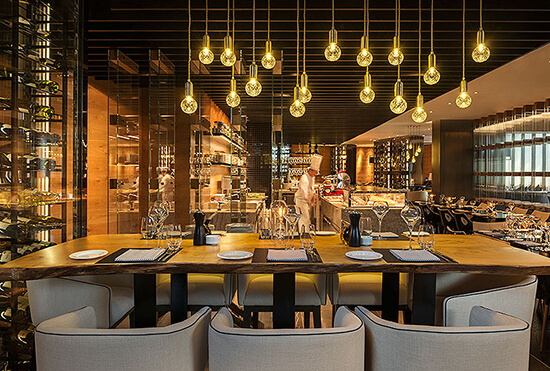 It specialises in nourishing Italian fare with plenty of flair – think lobster ravoli, truffle oil-laced risottos and wagyu steaks – but Frankie's USP is its special menus. Gluten-free, vegan and diabetic-friendly dishes are all available – with no compromise on quality or variety. The staff are accommodating to all dietary needs, so if you're looking for a hassle-free night out with plenty of options, Frankie's is the place to go. In 2016, Ramadan (the Islamic month of fasting) falls between June and July – but if you've booked your holiday during those dates, fret not. You won't be expected to abstain from eating – quite the contrary. You can still eat behind closed doors during the day, although bars don't serve alcohol until nightfall. The holy month offers a fantastic insight into Muslim culture and hospitality – and at sunset every day, everybody tucks into Iftar, a feast to break the fast. 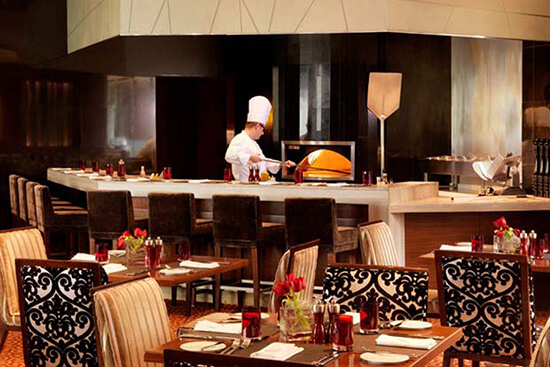 Abu Dhabi's restaurants lay on some of the most lavish spreads you'll ever encounter – and Le Royal Meridien's Ramadan Tent is always among the best. Here you'll find slow-cooked lamb, heaped biriyanis, hot and cold mezze, and more hummus than you've ever seen. With food this delicious and plentiful, you'll probably wish you'd fasted all day too. Feast your eyes on Abu Dhabi for yourself – speak to one of our Travel Experts about planning a stopover in this foodie haven to break up your long-haul holiday.